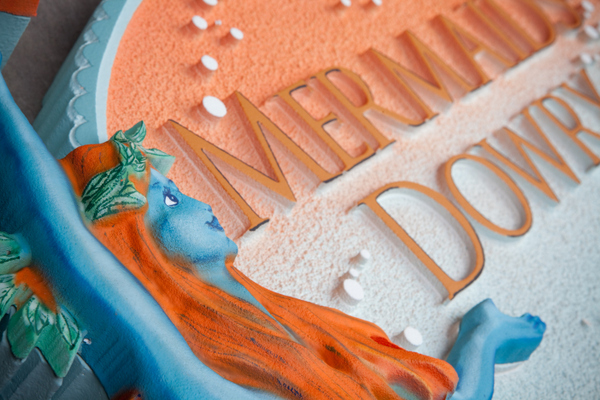 Above is a closeup of a carved High-Density-Urethane sign for a women's clothing store, "Mermaid Dowry". The sign features a 3-D carving of a mermaid, two starfish and marine bubbles. The lettering and double borders are carved in 2.5-D raised (flat relief). The sign is painted with long-lasting automotive-grade enamels and clear-coated twice, making it suitable for either indoor or outdoor use. It is protected against fading caused byUV radiation, and is completely waterproof. It can be hung from a scroll bracket or wood beam over a sidewalk, or mounted on a wall or placed in a window.